The Lenovo Helix hybrid Ultrabook/Tablet has generated more interest than any other product we’ve covered here and naturally many people are waiting for availability and final pricing. In Japan today, Lenovo announced that the Thinkpad Helix is now available for pre-order and delivery towards the end of April so it shouldn’t take long to filter through to other countries. Most online retailers in Europe are quoting 1-2 weeks until availability. 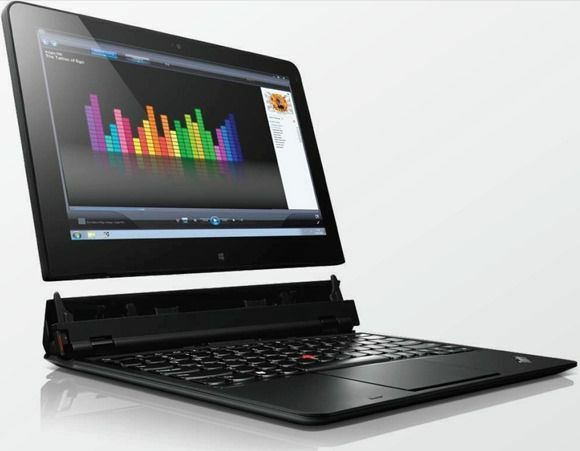 As for the USA, Lenovo had previously announced a $1499 model for April. Various models are showing at retailers. E.g. The Lenovo Helix will be one of the first Core tablets to use configurable TDP where downclocking and Turbo Boost restrictions are used to keep the tablet cooler and running for longer when undocked. Full power is only achieved when docked in the special fan-equipped docking station. All specifications and videos are in our information page here. Click through for images and newslinks too. There is much to love about this device, it screams quality, the dock isn’t just a usb hub, the flip around dock mode is ideal if you plan to use it often in a extended desktop mode (using full size keyboard, etc). But as uncompromising as it seems, there are some unknowns around what sensors it includes. At these prices it should include the full gamut. Hopefully this is a model that will see a quick “Haswell” refresh. Wow. GORGEOUS! And exactly what I wanted in a computer. Unfortunate it wasn’t available during my corporate refresh window (got the Asus UX31 Touch Prime instead). Crazy expensive but honestly it might be worth it.